WASHINGTON (Reuters) - The top U.S. Army officer told lawmakers on Tuesday that a return to deep budget cuts as required by law beginning in 2016 would make it difficult for the military to carry out even one extended ground war. General Ray Odierno, the Army chief of staff, told a panel in the House of Representatives that severe, across-the-board budget cuts would force the Army to shrink to 420,000 active-duty soldiers, a level at which it could no longer execute the president's national defense strategy. President Barack Obama's strategy issued in 2012 calls for a U.S. military strong enough to prevail in one major war while having the ability to deter an aggressor in a second conflict. That was a shift from the earlier longtime goal of being able to win two separate wars simultaneously. "I'm very concerned that at 420,000 we cannot meet the ... defense strategic guidance," Odierno told the Armed Services Committee. "I doubt that we could even execute one prolonged, multi-phase operation that is extended over a period of time." The Army chief told lawmakers the proposed $496 billion defense budget for 2015, which calls for an Army of 440,000 to 450,000 troops, would be able to meet the president's defense strategy, but with "significant risks." The original 2012 strategy called for an Army of 490,000 troops. 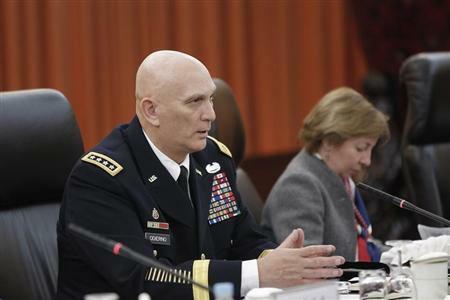 Odierno's budget concerns were echoed in other hearings across Capitol Hill on Tuesday as lawmakers quizzed senior defense officials about the president's proposal for Pentagon spending in 2015 and the department's five-year defense plan. Many lawmakers lamented declining U.S. military readiness following cuts to training and maintenance. Army General Curtis Scaparrotti, the head of U.S. forces in South Korea, said 28,500 U.S. troops currently in the peninsula could handle the threat from the North, but he said he was worried about the preparedness of reinforcements in a crisis. "I am concerned about the readiness of the follow-on forces," Scaparrotti told the Senate Armed Services Committee. "In our theater ... I rely on rapid and ready forces to flow into the peninsula in a crisis." And in a House appropriations panel, Navy Secretary Ray Mabus said budget uncertainty had prompted a year's delay in a Navy decision on whether to refuel or decommission the aircraft carrier USS George Washington halfway through its expected life. "We want to keep that carrier, and her associated air wing," Mabus said, but noted that the cost of refueling and operating it would be $7 billion over five years. "That's why we did it, to give us a little more decision space, to give Congress a little more decision space," he said. The budget concerns come as the Pentagon is struggling to implement nearly $1 trillion in cuts to projected spending over a decade as required by the 2011 Budget Control Act passed by Congress and signed by Obama. The law required $487 billion in direct cuts to defense spread over a decade, plus another $500 billion in automatic, across-the-board reductions that would not take place if Congress negotiated an alternative way to curb spending. Congress failed to reach a deal, and after several legislative delays the across-the-board cuts, known as sequestration, went into effect for the first time last year nearly halfway through the fiscal year. The move forced the Pentagon to put civilian defense workers on temporary leave and prompted the military services to idle some warships, cancel Army training, reduce flying hours and take other steps to save money. Concerned about the impact, Congress reached a two-year budget deal late last year that eased some defense cuts. But Pentagon planners have already begun worrying about what will happen when the deeper spending cuts return in 2016. Odierno told lawmakers the $496 billion defense budget for 2015, which met the caps set by Congress but also included a plan for $26 billion in additional spending, was the "floor of what we need" to carry out the U.S. defense strategy. "Once we go below that, we can no longer execute the strategy," he said. "We're going to have to ... amend the current strategy or develop a new strategy."